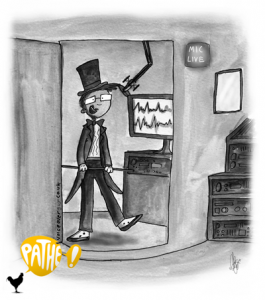 What is the Pathe Voice? When somebody says Pathe Voice they’re referring to the spiffing old English way of talking. Heavily used on TV and Radio in the 1940′s. The Pathe style sounds awesome with the right script, and thankfully you found the right chap to make a jolly good job on your script. Take a listen to the Pathe audio and be transported back in time. If you want to learn more about what Guy can do for you, download the VoiceoverGuy App or click the button below. Pathé News was a producer of newsreels, cinemagazines, and documentaries from 1910 until 1970 in the United Kingdom. Its founder, Charles Pathé, was a pioneer of moving pictures in the silent era. The Pathé News archive is known today as “British Pathé”.